Magic #16: Ready for Prime Time? Not quite, but getting closer (at least the cabin top and sides). I did 2 sanding sessions over the weekend, 3 hours on Saturday, and another 3 on Sunday. With the temps being as warm as they have been (high 80's) I only have so much working time in the boatshed before I feel like death is imminent. 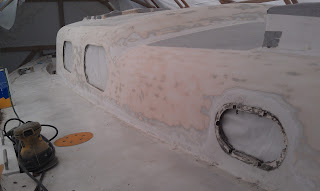 So I've used the past few mornings while it is still cool to get the cabin top and sides sanded down. The first thing I did was longboard the recored cabintop followed by the sanding down the bore holes I refilled the other day with the random orbital sander. 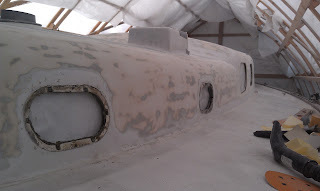 Finally I went around the whole cabin sides (except for the cockpit area), and sanded off any loose paint. 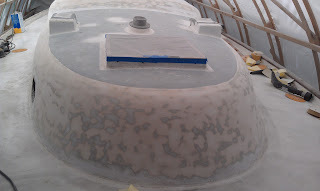 There was a lot and I'd say that 3/4 of the sides are down to bare glass and the rest is down to the primer. I still have to clean the butyl goop around the small port openings before I can get those sanded to well (it just gums up the sandpaper). Also, the area along where the deck meets the cabin sides has to be sanded a little more closely. I'll be knocking those spots off over the next few days. The primer should be here tomorrow, so I hope to get the first coat of primer on the cabin top and sides before we go to Maine for vacation next week.